Please contact us for more details. We would love to discuss your vacation plans at our Home Away from Home. We are Pet Friendly and are happy to welcome any fur members of your family. Our cottage is newly renovated, with a full kitchen and two bathrooms. Our living room has a large flat screen TV and a working fireplace for the crisp New England Autumn nights. Upstairs there are three bedrooms with views to the ocean. Outside is a garden oasis, which includes a small garden, backyard deck, and large grill set up. We are only a two minute walk to the beach and the park. We are also within easy walking distance to the Shalin Liu Performance Center, where music artists play throughout the year. Cottage on the Lane is perfect for your vacation get away or family reunion. Step away from your hectic life. Welcome to our homes by the sea. The scent of the ocean. The crack of a lobster claw. Stirring coffee as your eyes dance over to the sun rising over the old church steeple. New England life at its finest. Maybe you’ll while the day away in the numerous quaint art galleries. Maybe you’ll sample the best fresh seafood on the eastern seaboard. Or simply spend the day staring at the ocean. We can’t think of a better way to spend a vacation. Sure, we’re biased. Our family has had a home in Rockport for almost 400 years. Each of the three cottages were built by our ancestors who were local fishermen, and has been a base for our family throughout the seasons and years. Let us open our homes and welcome you to spend time in this little slice of perfection. This cottage has been in our family for generations. We cherish the time here and enjoy sharing it with our guests. Rockport is the perfect New England town and our cottage is only two minutes away from exploring the beach and all the stores and restaurants that the town has to offer. Located one street up from the water, overlooking the ocean. Newly installed central air conditioning. A vast array of towels available as well as beach towels. All paper supplies -napkins, paper towels, food wrap, baggies, foil, etc. Spices and staples such as flour, sugar, coffee and starter breakfast items. A great supply of dishware handed down through the family. We maintain a large collection of books - take a book/leave a book. Many classic board games available to play. Sand toys for the beach. Table w/chairs. Beach chairs are available for guests. We have bikes available for you to explore through Rockport, beach chairs available - all paper products including food wrap are provided and cooking spices. Linens and beach towels provided. Ample, free parking. Our home is much more than a cottage - it is our family get away which has had two recent major renovations. The location is prime to enjoy the views, beach, Bearskin Neck and all of the amenities of Rockport. We welcome you to enjoy. Very well-cared for property with many personal touches. Charming, cozy, and fully-outfitted, including thoughtful snack items and coffee! Beautiful views of ocean from living room and two out of three bedrooms. Our adult children stayed there over the holidays and found it very convenient and pleasant. We are so pleased that your family enjoyed staying at Cottage on the Lane. We hope that you will come back to visit us again in the future. As this is our family get away home, we are always excited that other families find it as special as we do. The cottage is charming (modern), immaculate and has everything you need for a relaxing vacation. The location was perfect (a quick walk to town and front beach), breezes off the ocean were amazing and the backyard was a peaceful oasis. I would highly recommend Cottage on the Lane. Fabulous vacation rental! Everything was perfect - the home is adorable, the location cannot be beat, and the owners are absolutely wonderful. We stayed in the home with our two teenagers, and it was very comfortable for all. The kitchen was extremely well-stocked - we love to cook so this was a bonus for us. And we loved eating in the backyard - the perennial garden in absolutely beautiful. There are also so many wonderful restaurants in walking distance that we took advantage of as (as well as lots of ice cream stores). The beach is literally a two minute walk away, and is a nice family beach - my kids particularly enjoyed the dock that they could swim out to. And Louise is so kind and accommodating. Thank you so much for an incredible summer! We can't wait to be back! We enjoyed having you and your family stay at Cottage on the Lane this summer. And we are even happier that you had a great Rockport summer making memories at our family home. Being close to the beach, Bear Skin Neck and all of the amenities that the community has to offer is a bonus. We invite you to return when your vacation plans call for another get away at our special “cottage”. It was a pleasure having your entire family. Could not have been nicer. The cottage was even prettier than I'd expected. Very comfortable and charming, and having a fireplace with ample wood during a howling snowstorm made it so cozy!! Our hostess had provided all kinds of thoughtful snacks, the kitchen was well stocked, beds were comfy, Rockport was charming as ever. We couldn't have been more pleased. We are most appreciative of your review comments and are very glad you enjoyed your stay at Cottage on the Lane. It is near and dear to our hearts. Hope to see you again in 2018. Safe travels and look forward to your return. I grew up in Rockport so I know the town well. This is a great place to stay. My two daughters and I spent a wonderful week here. 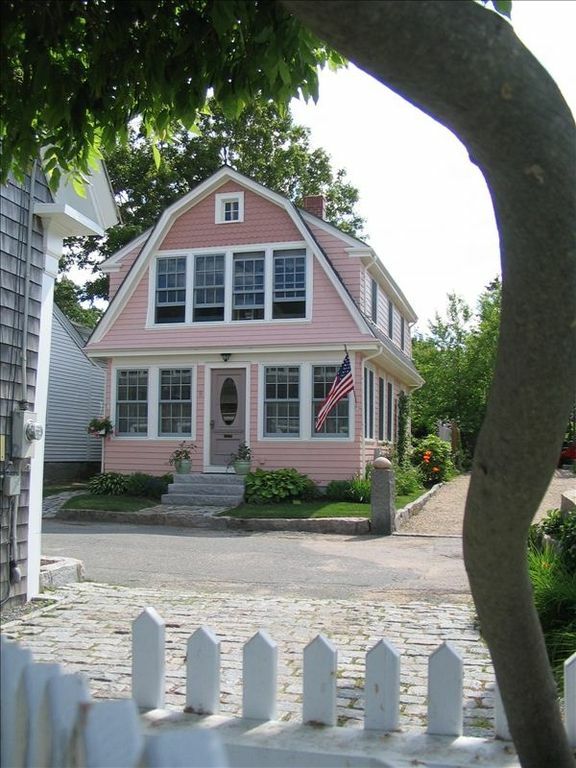 The house is on a quiet but perfectly central location, very close to Front Beach and to downtown Rockport. It would also be an easy walk from the train station. The house looks like it was recently renovated and they did a very nice job of it, not just to clean it up for tourists. Everything we needed to be comfortable was there, including a lot of books, towels, and even some basics in the fridge. The owners are very responsive and helpful with suggestions, if you need them. We would absolutely stay here again. We are pleased that you enjoyed your family stay at our home. Look forward to having you return in the future. Summer is a great time but the fall and winter months have a special feel of their own in magical Rockport. This is a lovely home. Close to EVERYTHING, yet on a quite lane with views of the ocean! A picture perfect historical artist Colony in the North Shore. Note: For the 2014 season we will only be accepting a two week rental minimum.